Identify 24K BULLION - 22K - 18K - 14K - 10K GOLD! Identify FINE SILVER-STERLING SILVER-COIN SILVER! Identify PLATINUM from WHITE GOLD from PALLADIUM! ONE PEN DOES IT ALL AND DOES IT WELL! PEN CONTAINS INK AND BATTERIES FOR IMMEDIATE TESTING! This amazing product works with your safety in mind. PEN DOES NOT CONTAIN HAZARDOUS ACIDS!. IN US: Please mail $39 Total for the Pen. International: Please Mail $70 Total for the Pen. Personal check or money order in US $ is good. Tests precious metals by dissolving the metal surface into an identifying colored ink. 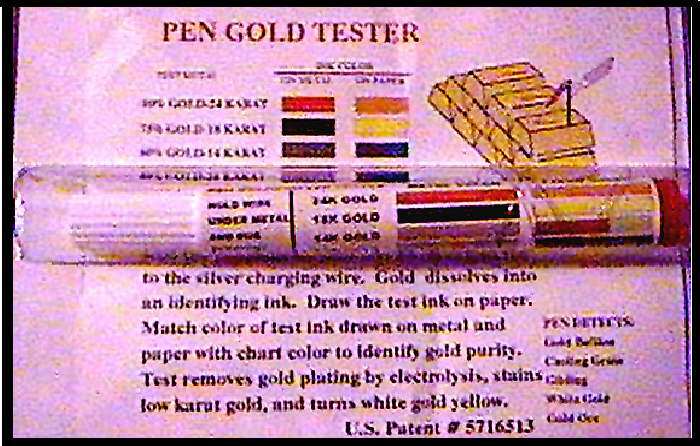 PEN PROVES YOUR PRECIOUS METAL AS BULLION (100% PURE)? Much gold is thrown away as costume jewelry when it really is under 10k gold. Much white gold is actually platinum. Most gold and other precious metal is identified by its resistance to nitric acid. This simple test is great for identifying yellow gold. However, acid cannot differ white platinum from many other white metals such as stainless steel. The acid test also misses 8-9k Irish gold, the alloy being too low in gold to resist the acid. And, 22k Indian gold is usually sold at 18k prices since most acid test kits do not contain 22k acid. 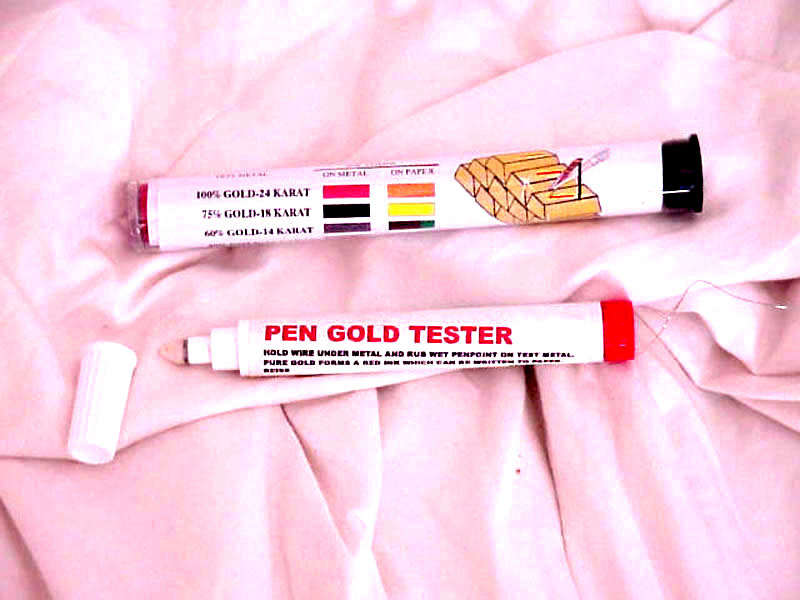 The more expensive electronic testers also miss white gold. They do work on modern yellow gold alloys. They do not work on many antique yellow golds. Look for antique white gold, especially 18k. Some of it will be more expensive platinum. The pen allows very rapid testing of costume jewelry. Look for a brown color, indicating 10k or 14k gold. Very little gold is 10k or 14k plated. Any gold that tests with a red color is probably plated. A lot of 10k gold is bonded, meaning solid 10k gold is welded over brass. It has some value and is usually marked as 1/20 gold. There is no bargain in hallmarked jewelry. It is either as marked or less. 1. HOLD PEN WIRE UNDER TEST METAL. 2. RUB PEN POINT ON TOP OF METAL. 3. GOLD METAL DISSOLVES INTO AN INK. 4. DRAW A LINE ON PAPER WITH THE INK. 5. TEST ONLY A BRIGHT METAL SURFACE. The salt in the pen barrel is not hazardous, but the ink may irritate skin. Remove ink from jewelry with ajax or comet cleansing powder wet with water. Always test known gold first. Plated gold on costume jewelry is a problem with all metal testers. Acid and Mizar type testers require filing. Mizar then further requires lacquering around the unfiled test area before dipping in its electrolyte. With the pen, rub the same test spot 5-10 times. Thinly plated gold shows little, if any color. Thickly plated gold will crack, which you can see and feel with your fingernail. Good gold will not crack. A lot of white gold for diamond rings is now rhodium plated to avoid nickel allergies. Rhodium plate, usually thin, must be removed as above to test the gold beneath. 24K- a red ink that remains red on the metal. 22K- a red ink that turns black within 5 seconds. 18K- a thick black ink. 10K- a thin black ink. WHITE GOLD: Nickel/Gold surface is turned to yellow gold. CAUTION: Testing removes rhodium plate revealing yellow gold. CHAINS: Attach the wire to aluminum foil, lay the chain on the foil, and test a link surface. PLATED GOLD: Crack the plate by repeatedly testing the same surface. GOLD INK COLOR ON PAPER: Use only white printer paper. 18K-24K: Makes an orange (red+yellow) ink on paper. 14K- Makes a brown ink (red from gold+green from copper). A line drawn on paper starts brown and ends green. 10K- Makes a brown ink (red from gold+green from copper). A test line also starts brown, but ends with more green. 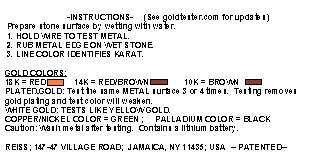 WHITE GOLD: Nickel/Gold makes a brown ink (red from gold+bright green from nickel). A test line starts brown, but ends bright green. Rhodium plated gold makes a green ink. PLATED GOLD: Little ink color, usually red from 18-24K plating. SILVER: Mark the metal surface as with gold. A gray metallic ink forms. Expose the ink to light. Times below are for a 100 watt light bulb. In bright sunlight, ink turns black about 10 times faster. FINE SILVER (100%) Ink will turn black within 30 minutes of exposure. STERLING SILVER (90%): Ink will turn black within 10 minutes of exposure. 50%-75% SILVER: Thin ink turning black within 2 minutes of exposure. PLATED SILVER: Repeatedly test the same surface to reveal the underlying base metal. 50%-100%): Silver makes a white Ink that does not color paper. Any green color is due to the nickel or copper alloy. PLATINUM (100%): White metal surface is not marked. PLATINUM INK: Makes a bright orange ink on pen point and paper. Ink fades rapidly to yellow on printer paper. PALLADIUM(100%): White metal is marked with a purplish black color. PALLADIUM INK: Unlike silver, the ink also writes black on paper. 1. A strong red color on a yellow metal indicates gold plate. Except for bullion, little jewelry is high karat gold. 2. The LR44 batteries are rated for 10-20 hours of contact time. 3. Intensify color by more forceful pen point contact to the test metal. 4. Test a known metal before an unknown. 5. A white metal giving a green ink may be rhodium plated gold. Refill kit includes: ink bottle; 2 batteries; pen point. push pen point fully in barrel. hold wire across barrel; reinsert end cap over wire. Add ink to pen point, one drop at a time till no more is absorbed. Smallest Gold Karat Tester in the world. Very easy to use and carry. Contains patented color testing reagent without dangerous acid. With practice you can simply, quickly and safely identify gold anywhere. GOOD FOR THOUSANDS OF TESTS 6 MONTH REPLACEMENT GUARANTEE. 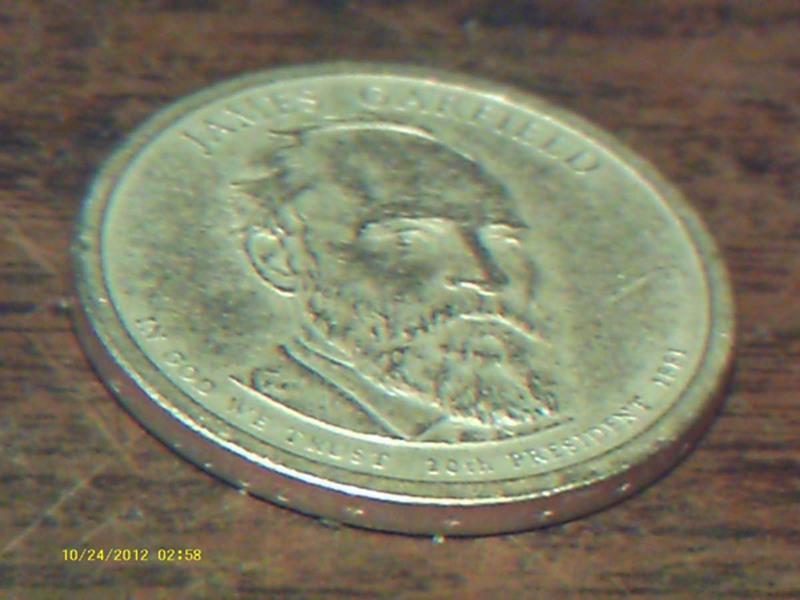 Examples: (1) A 1980 brown copper penny made a green line. The tested area on the penny turned bright (2) A gold charm was tested on its edge and made a pale red karat line. A second rub on its tested edge made a green color. The metal was gold plated brass. (3) A gold ring was rubbed 3 times on the stone making 3 solid red karat lines. The metal was 18k gold. (4) A silver colored ring edge was rubbed 3 times on the stone making 3 solid brownish red karat lines. The ring was 14k white gold alloyed with nickel. (5) A small yellow nugget was rubbed on the stone making a bright orange line. The metal was 22k gold. (6) A golden crystal rubbed on the stone made no color. The crystal was fool's gold. Signed by the Indiana Jones archeologist of the 1950's, Wendell Phillips, who revealed many treasures from the 3000 year old Sabaean MoonTemple of Queen Sheba in the time of King Solomon. His last expedition to South Arabia ended in 1952. Later international laws outlawed antiquity export from Arabia. Purchased in a New York City fleamarket because the stone remained cool in the hot sun. Makes an exciting show piece on my desk. Does not crack when dropped. Fizzes when touched with acid. Stone is marked with an identifying reference number: TC972. Appearance: 10 inches by 6 inches by 3 inches. Light tan patina. The limestone is a genuine biblical antiquity from Sheba according to the email below. Thank you for sending the pictures so fast. I can only tell you they look authentic except that Wendell would not have put his name on any artifact. We checked the photos with our field notes and it does match the TC972 drawing that we have. 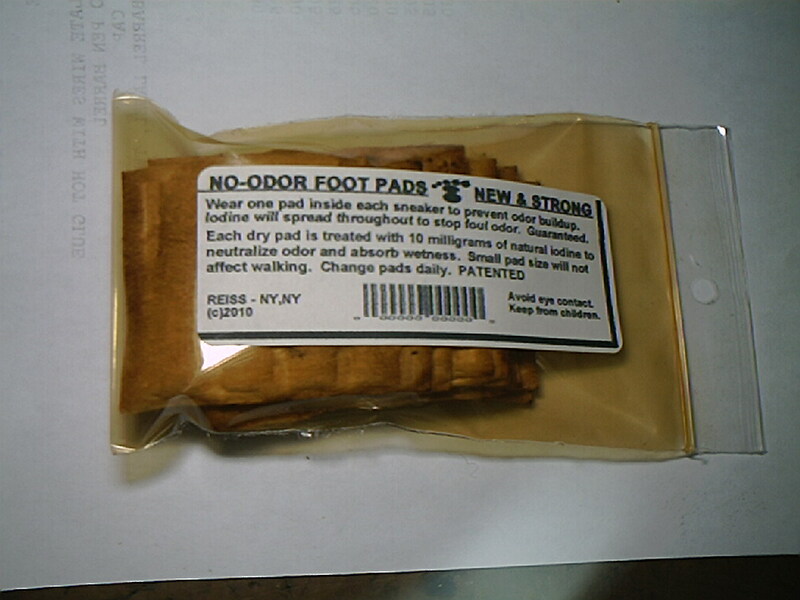 WIPE DRY PAD OVER CONTAMINATED SKIN AND FUR. STOPS SWELLING AND ITCH FROM MOSQUITO BITES IN FIVE MINUTES. WIPE ON INFESTED ANIMAL FUR AND WATCH FLEAS RUN FOR THEIR LIVES. MAY PROTECT AGAINST WEST NILE FEVER. IODINE IS KNOWN TO KILL THE VIRUS. 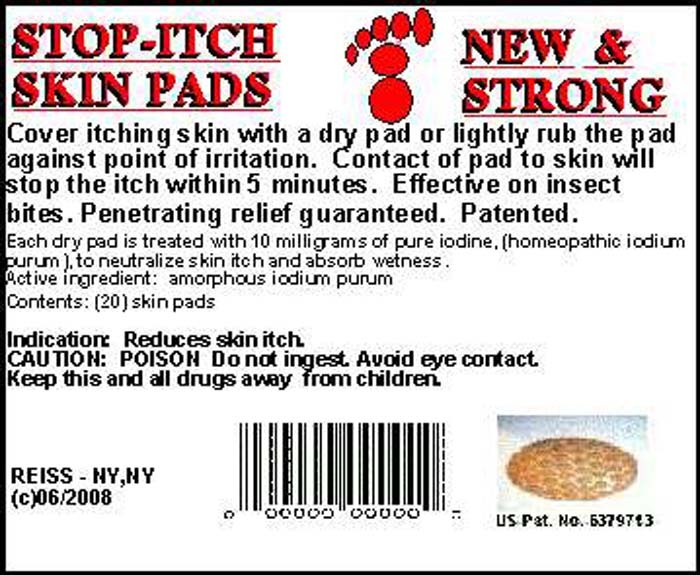 PADS CONTAIN ONLY NATURAL PURE IODINE. CAUTION: DO NOT WIPE AROUND EYES. 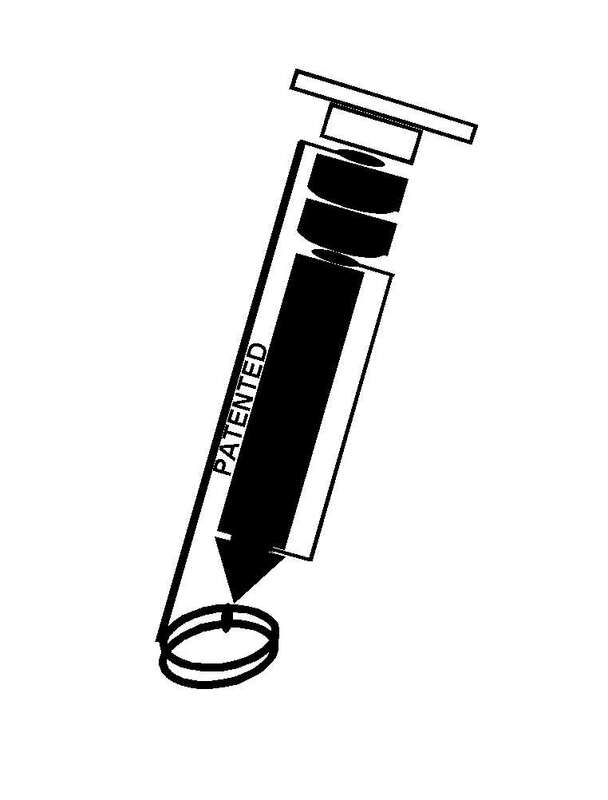 Average pen contents: 3ml waterless fluid, 200mg silver. Extends range of pcb antennas. 1. CLEAN PCB. COPPER METAL MUST BE BRIGHT. 2. RUB PEN POINT OVER COPPER METAL YOU WANT SILVERED. 3. COPPER METAL WILL DEVELOP A SILVER PLATE. 4. LET BOARD DEVELOP FOR ABOUT 5 MINUTES. 5. WIPE OFF INK WITH A PAPER TOWEL MOISTENED WITH AMMONIA AND DRY TO REVEAL A SILVERED CIRCUIT.